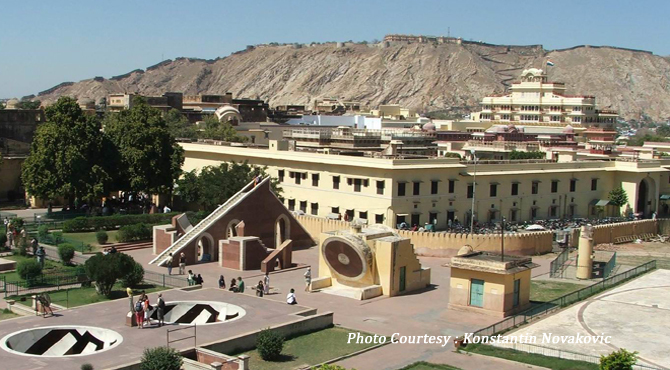 The world-renowned astronomical observatory, Jantar Mantar, in Jaipur is one of the five astronomical observatories built in the 18 th century by Maharaja Jai Singh II, the genious who built Jaipur City. One of the major landmark of the Jaipur city, it is a unique building on its own that differentiate Jaipur from other cities. Among the five observatories, Jantar Mantar is the best preserved. The open-air observatory with 18 instruments in all, erected between 1728 and 1734 (many of Maharaja Jai Singh II's own invention), consists of a dozen-odd metal and masonry structures used for astronomical calculations. Literally known as 'Instruments for measuring the harmony of the heavens' each instrument of this observatory is used for a particular function and gives an accurate reading. Some are still used for forecast.There are 18 different Yantras placed in clockwise at the observatory. One can hire a guide at the gate who will tell a detail description about this yantras and avoid coming on an overcast day because all the instruments require sunlight to function. Entry fee Rs 10; Timings : 9 am to 4.30 pm. The Small Samrat Yantra is a triangular structure consists of a large sundial marked with hours and minutes. The Samrat Yantra's gnomon is a huge triangle made of local stone and are constructed on Jaipur latitude 270 North and give Solar time. To adjust the reading to Indian standard Time (IST), between 1 minute 15 seconds to 32 minutes must be added according to the time of year and solar position. The arc at the left side will show the time from sunrise to midday and the right side will show the time from midday to sunset. By observing where the shadow is sharpest, the time is calculating. The Dhruva Yantra locates the position of 12 Zodiac signs and the Pole Star at night. The traditional unit of measurement is the human breath calculated to be of 6 seconds duration. Thus 4 breaths = 1 pala (24 seconds), 60 palas = 1 gati (24 minutes), 60 gatis = 1 day (24 hrs). The Narivalya Yantra is a sundial with two dials. The first dial facing towards south, to read time when the sun is in the south hemisphere (21 September to 21 March) and the other one is at the north facing towards the north for the rest of the year. At noon the sun falls on the north-south line and the time is read in normal way. Next is Jai Singh's seat (Observer's seat). Also known as the mirror of the Heaven it is a bowl-shaped instrument over 5 meters across whose interior is divided into marble-covered surfaces. One can enter here, through the spaces between the interior surfaces. Shasthansa Yantra, is a darkened chamber with a pinhole through which the Sun's rays enter the chamber when the Sun is at its zenith. There is a scale that can be used to measure the declination and diameter of the Sun. The Kranti Yantra is used for direct measurement of the longitude and latitude of the celestial bodies. The Raj Yantra is the King of Instruments used only once in a year to calculate the Hindu calendar. The Unnsyhsmsa yantra is used for finding the altitudes of the celestial bodies and Disha yantra points to the north. The Dakshina yantra used for observing the position and movement of heavenly bodies when passing over the meridian. The Large Samrat Yantra operates on the same principal of Small Samrat Yantra. However, it is ten times larger and accurate to 2 seconds instead of 20 seconds than the Samrat yantra. The sundial of this yantra is 27.4 meters high hence, the observer could climb the steps to make the reading. During Guru Purnima, the holy full moon, in the month of July/August, this yantra is used to predict the length and heaviness of the monsoon for the local area. The Rashivalayas Yantra has 12 sundials for the signs of the zodiac and operated in the same way of Samrat Yantra. The instruments enable readings to be made at the instant each zodiacal sign crosses the meridian. Hindus believes that their fated souls move with the rhythms of this zodiac. The Jai Prakash Yantra act as a double check on all the other instruments. The Chakra yantra gives the angle of an object from the equator.